West Pre-K Royalty!!! 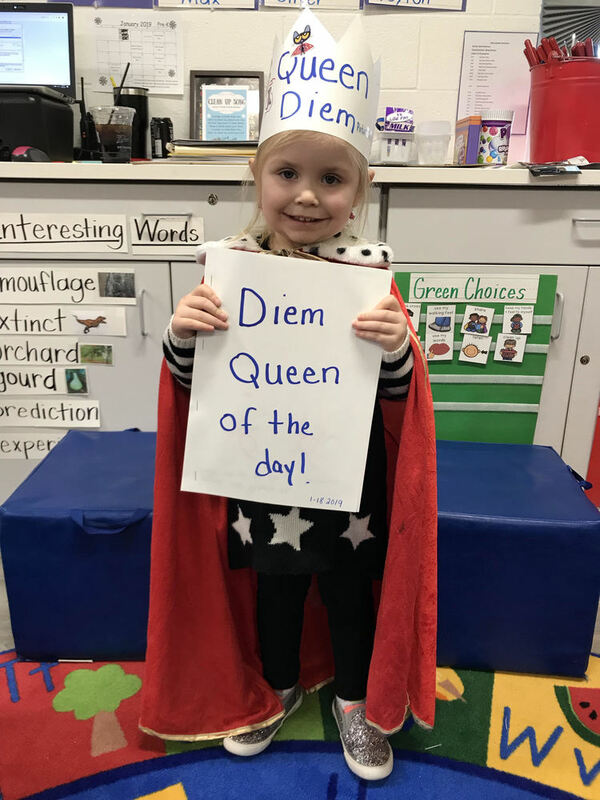 Each day in January, each Pre-K class chooses a King or Queen of the Day. With the sounds of a trumpet playing a royal entrance, a name is drawn out and a King or Queen is crowned for the day. Each student draws a picture about what they have learned about the Queen or King while the Queen/King decorates a crown. We compile each page to make a book that we read aloud to the whole class and the child gets to treasure the crown and book at their home forever. The skills learned during these exercises are so valuable: patience waiting their turn (this is huge for some), how to ask a question (which is very hard at this age), how to answer a question, recalling what they have learned, listening skills, drawing and writing skills, and most importantly CONFIDENCE and PRIDE. The student pictured above is Diem Hurt from Ms. Anderson’s and Mrs. Murphy’s PM class. If you know a pre-kindergarten student at West Elementary ask them about the King our Queen of the day!